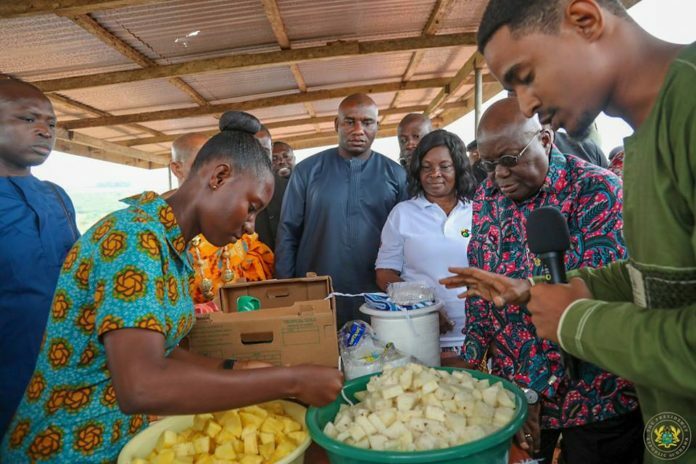 The Executive Director of Danquah Institute Edward Asomani says the Akufo-Addo government has constructed 70 new factories under the One District, One Factory promise since it assumed office. Unable to name the factories and their exact locations, Mr Asomani said the factories have recruited many unemployed Ghanaians. “The NPP government inherited a bad economy and we noticed we couldn’t build a strong economy relying on donor support and loans. There is a lot work to be done but the NPP is moving in the right track to ensure things happen. “We cannot continue to produce raw materials only as a country and think we will go anywhere. We have 70 factories that are running. They are running and I know a lot of Ghanaians would have been employed in the sector. There is a lot to be done and a lot has been achieved with this government. Let’s just be patient with the government,” he told Francis Abban on the Morning Starr Thursday. President Akufo-Addo then opposition promised to establish at least a factory in all 275 constituencies across the country. The promise was widely bought in by Ghanaians playing a part in the party’s victory against the NDC and then President John Mahama in the 2016 elections. The government has however struggled to prove to critics that they have indeed been able to establish those companies. In many instances the government has refurbished and adopted existing companies under the scheme.